This creamy coleslaw is light, healthy, budget-friendly, and great to taste. You will love the combination of fresh vegetables, yogurt, and mayonnaise. 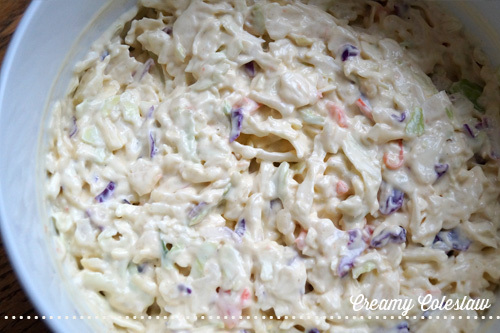 Dijon mustard turns coleslaw into a delicious and delightful side for any occasion. It is a diet-friendly veggie medley and a great substitute for classic coleslaw you buy at the local store. It is quick and easy to make as no shredding is involved. It's been a staple when guests are coming over and everyone just loves it. You can fix it the last minute or ahead of time. To make this healthy low carb coleslaw, first whisk Dijon mustard, yogurt, and mayonnaise in a small bowl and combine well. You may also use a food processor to process and blend the ingredients. Process until smooth and creamy. Season with black pepper and salt to taste. You can also add 1/4 cup of milk, 1 tablespoon of lemon juice, 1 tablespoon of white vinegar, and 2 tablespoons of butter milk if desired. Use a large salad bowl and add the shredded coleslaw mix. Pour the dressing over the coleslaw mix and combine well. Add freshly ground black pepper, or salt if desired. Refrigerate for 2 - 3 hours and serve with the main meal. Refrigerate overnight if serving on the next day. Makes for a great side dish for a barbeque, picnic, or family dinner and takes about 10 - 15 minutes to prepare.